What is Grazax used for? Grazax is a type of medicine that makes the body less sensitive to certain allergens. 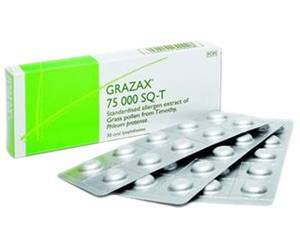 Grazax tablets contain an extract of grass pollen allergen (Timothy grass). The grass pollen extract is thought to stimulate the body's immune system to produce antibodies against grass pollen. This approach is called immunotherapy. Grazax is a prescription-only medicine. Shortness of breath and/or asthma attacks. For the greatest effect, Grazax tablets should ideally be started four months before the grass pollen season starts. Remove the tablet from the blister pack and place it under the tongue. Leave it there for a few seconds until it dissolves. Try not to swallow for a minute. You should not eat or drink for at least five minutes after taking the tablet. It is recommended that you continue the treatment for three to five years. During this time your allergy symptoms will gradually start to improve. If your symptoms have not improved after two pollen seasons, you should consult a doctor. one tablet once a day, dissolved under the tongue. Most side effects are temporary. If you experience any swelling of the face, mouth or throat, difficulty breathing or worsening of asthma after taking this medicine, you should consult a doctor immediately. For a complete list of possible side effects, see the package leaflet. You have recently had surgery on the mouth, a tooth removed, or a tooth fall out. In this case, this medicine should be stopped for seven days until the wound has completely healed. Consult a doctor on the use of Grazax if you have a severe allergy to fish or if you've ever experienced an allergic reaction to grass pollen injections. Grazax may interact with other medicines. Therefore, it is important to tell the doctor what other medicines you are currently taking. Treatment with Grazax should not be started in pregnant women, as the effects of Grazax during pregnancy are not yet known. If you get pregnant while taking Grazax you should tell your doctor. Your doctor will let you know if you can continue this treatment. Seek medical advice from your doctor before using this medicine if you are breastfeeding. Grazax does not interact with alcohol or affect your ability to drive safely.